Take advantage of our Wedding Special Custom tuxedos and/ or suits for the Groom and his Men starting at $300. Why rent when you can make it Uniquely Yours at a great price? You design it, We'll make it! We believe that the tuxedo worn at your wedding is just as important and special as the gowns for the brides. It should be something that should be cherished, saved and more importantly not returned to the store it was rented from after countless others have already worn it. At our great prices, you have the opportunity to keep it, save it and wear it again at any other special occasion that you choose. Why not relive that special day over and over again and tug at both of your heart strings every single time it is worn. You can even wear it again if you choose to renew your vows. Our absolute favorite part of the wedding preparation process is when the couples see their creativity manifested in the suit/ tuxedo that they have designed to match perfectly with the theme of their wedding. We can't tell which half of the couple is more excited when he tries it on for the first time. KEEP IT SPECIAL, DESIGN IT YOURSELF, CUSTOM MADE FOR YOU. DON'T RENT OR BUY OFF THE RACK. Designed by our customer ready to be worn for his next special occasion. Designed for our Beaumont couple. Dark suit with light contrast circle lining. Perfect combo. We loved the lapel design on this one as well. Three piece suit designed for the groom. We love the contrast with the paisley lining. One of our custom designs. We designed the waistband of the pants to match the jacket fabric. You really can be as creative as you would like. Mix and match materials, colors, fabrics, linings. The possibilities are endless. You design it, we'll create it. 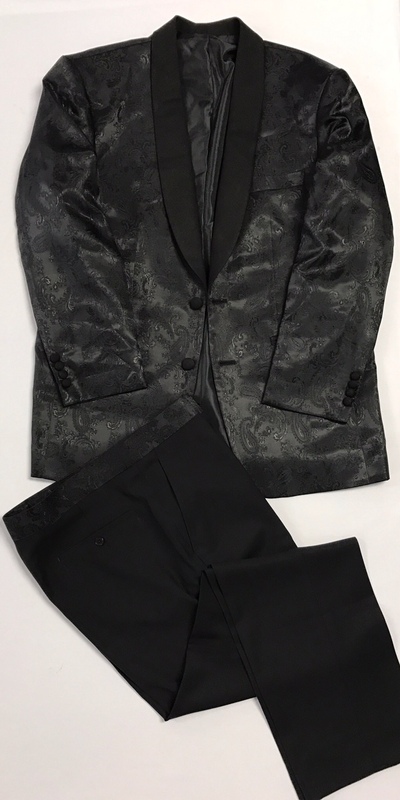 Tuxedo designed by the groom for his groomsmen. Please list the days and times you are available to come in for a custom fitting and design appointment. Or you may call us at 832-559-1155 to schedule. Send us also your color schemes so that we may present you with design ideas at the time of your appointment.